What Is A Steamer Trunk? So what exactly is a steamer trunk, and why do I keep hearing about them? A steamer trunk is a large piece of luggage. It has hard sides and a hard top. Sometimes they are made out of wood planks nailed or glued together, sometimes vintage steamer trunks are made from a combination of wood and metal. Some newer ones are made from metal exclusively. If you're asking the question 'what is a steamer trunk', you're probably looking into some sort of storage or decorative features for your home, as these pieces are not really used for travel anymore. This article is about the history of the noble antique steamer trunk, so you can learn a bit more about their usage and usefulness today. Also, it will help you gain an appreciation for the piece if you should decide to use it in your home decor. 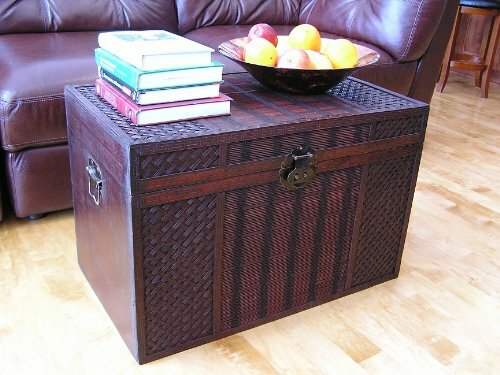 Antique steamer trunks are really cool pieces that literally carried history around, so they're well worth picking up. Let's learn a bit more, and answer the question, "what is a steamer trunk?" To answer the question 'what is a steamer trunk', we must look at the history of the piece and where it comes from. Antique steamer trunks, in concept, have existed since the 1600s. Early versions of these useful pieces were used in sailings across large bodies of water. Later on, vintage steamer trunks were actually known as 'stagecoach trunks', due to their use in these forms of transportation. Later on, other versions of the antique steamer trunk came into existence. The round topped 'saratoga trunks' were very fashionable in the late 1800s, and they were designed with a humped lid in order to keep their luggage from being piled anywhere but the top, where it was least likely to be damaged. The term for the antique 'steamer trunk' was derived from the most common usage: travel aboard a steam ship. These large wooden or metal boxes were perfectly made for steam ships. They were heavy and squat, so they wouldn't move around a lot. They were strong and capable of protecting a person's goods. The square shape and flat tops of most vintage steamer trunks made them ideal for stacking, maximizing storage capability. 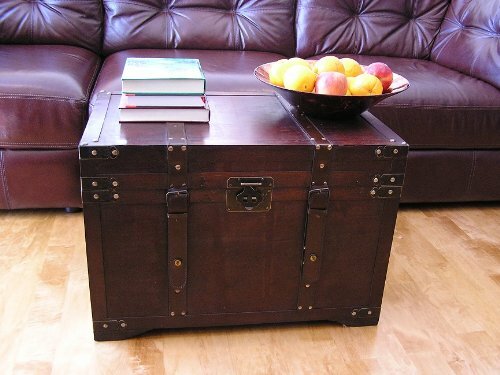 Vintage steamer trunks were usually coated in either metal, leather or canvas with some sort of resin or lacquer on it. This protected the box itself, the wood construction, and most importantly, the contents. Antique steamer trunks have clearly had an important impact in our history. Not only have they carried around most of the world's personal belongings for hundreds of years, they are even reknowned. Look at a pirate's treasure chest! The vintage steamer trunk, though extremely useful, has fallen out of favour today due to the advent of airplane travel. In the smaller, more cramped confines of a plane, we need more compact and pliant luggage. The antique steamer trunk should not be forgotten, however, as it's still a fantastic means of storing and transporting goods. It beats the heck out of a rubbermaid bin! The most popular useage for a vintage steamer trunk is decorative nowadays. People use them as coffee tables or outdoor storage solutions. If you're creative, you can come up with a unique use for these really cool pieces. 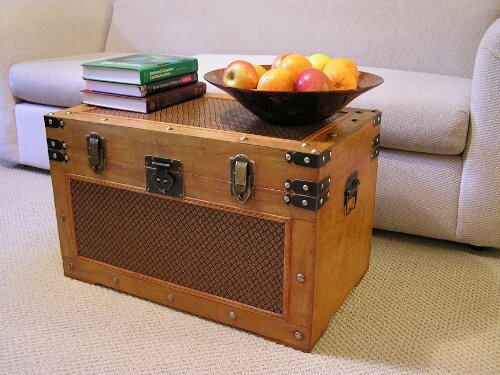 Now that we've answered the question 'what is a steamer trunk', you can go out and find an old one for yourself!